Located in the enormous Dubai Mall, the recently-opened Dubai Aquarium and Underwater Zoo is fast becoming one of the Emirates' most popular attractions. Featuring the largest viewing panel and one of the biggest tanks in the world, visitors have the opportunity to experience the incredible underwater domain of thousands of creatures of the deep. Highlights include feeding time for the enormous Sand Tiger Sharks and the majestic Stingrays. 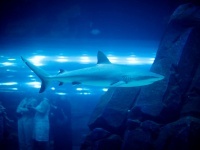 The aquarium and zoo is home to over thirty-thousand types of sea life and provides an exciting, educational day out for adults and children alike.